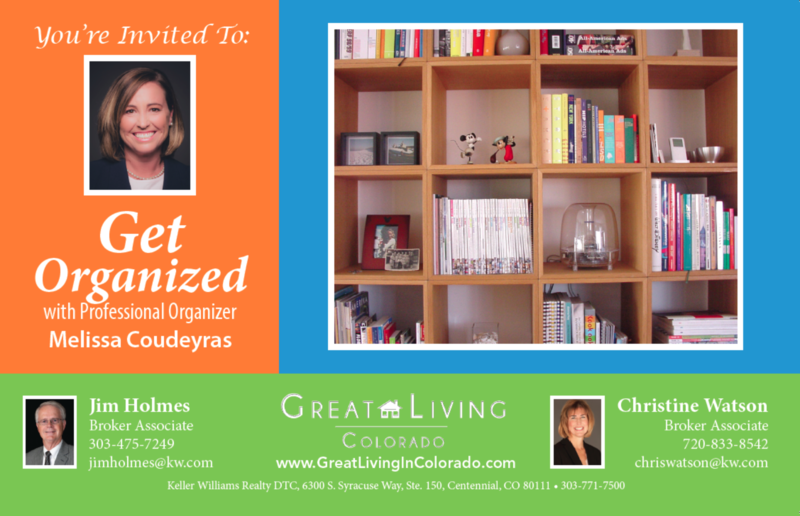 Get Organized with Professional Organizer, Melissa Coudeyras! "Let Us Help You Start The New Year Organized!" Please park and enter building on west side. Refreshments will be served. Space is very limited, if you wish to attend please RSVP via 720-833-8542 or chriswatson@kw.com, and let Christine know which date & time you’d like to attend. Melissa has been a military spouse and moved seven times in the past 18 years. Purging, packing, and organizing everything into a new house inspired her to become a professional organizer. She loves to help others and feels that she can make a difference one room at a time. All of this inspired her to launch her business, Yes You Can Professional Organizing L.L.C., a year and a half ago.